Well, summer is over and we’re starting our fall trips now, but here’s an update on our summer activities. What a time we’ve had going to Nevada and Washington reservations! 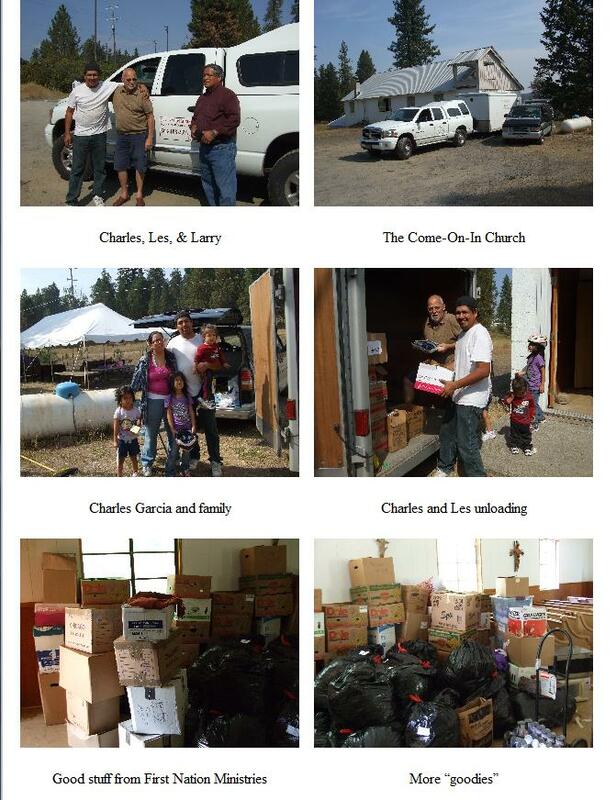 We were able to take food, clothes, and household goods to Tulalip, Colville, and Fort McDermitt because of your faithful support of this ministry. How privileged we are to do the leg work for YOU because this is YOUR ministry! The folks are always so grateful for the things we bring to them and we get to receive the “thank you” and the hugs that you never get to see. The ministry is growing and we’re excited, but we need a warehouse desperately! Please pray with us that the Lord will provide one. If you’ve been to the office recently, you know what I’m talking about! Now, as soon as we return from South Dakota we will be going to St. Ignatius, Montana with a load for Bernie on the Flathead Reservation. Then we need to go to the Spokane Reservation with Christmas gifts, a piano, and books for the library they’re starting in the church. We also need to make trips to Colville and Celilo with Christmas gifts, books for libraries, and food, etc. Pray with us that the weather will cooperate and that our journeys will be safe and the time we spend with our Native pastors will be a blessed time of fellowship. We are putting the Big Rig up for sale after the South Dakota trip so that we can buy a more economical moving style van. This will allow us to deliver a load without overwhelming the recipients and will also cost less to run. Also, more people will be able to drive it without an “A” license. Well, Teammates, it will soon be November with the holiday season starting. I hope we all thank the Lord each day for His gifts to us. His protection is constant; His comfort is ever-present. Wouldn’t it be awful if God remembered us only as often as we remember to be thankful to Him? Let’s make it a regular part of our lives to thank the Lord for His continuing mercies. God wouldn’t let a moment go by without thinking of us. “When you go through deep waters and great trouble, I will be with you. When you walk through the fire of oppression, you will not be burned up; the flames will not consume you, For I am the Lord, your God, the Holy One of Israel, your Savior.” Isaiah 43:2-3. I pray the Lord’s richest blessings on you and THANK YOU for all that you do for this ministry. Les Phipps and Larry McKinney headed out in the Ram with the Wells Cargo trailer filled with goods for our first trip to the Spokane Reservation. What joy to receive a call from Charles Garcia, whom we had known from Fort Berthold, North Dakota. He had been in ND to care for his mother who has now passed away, so he recently moved his family back to his wife’s rez to pastor the 100 year old church there. His excitement is contagious! He told us how the Lord is opening doors for a church building, a home for his family, and a congregation and he was wondering if we could help him. We were so happy to say, “YES!” and now we’ve made our first trip there (one of many, we believe). Please pray for this new ministry and “thank you, Larry” for helping us on this trip. The Tulalip people are descended from several older indigenous peoples such as the Snohomish, Snoqualmie, Skagit, Samish, and others. This reservation is roughly 22,567 acres with a population of around 10,000 and, although it has 2 casinos and a luxury 12-story hotel, many people on this reservation are hungry and in need of clothing. 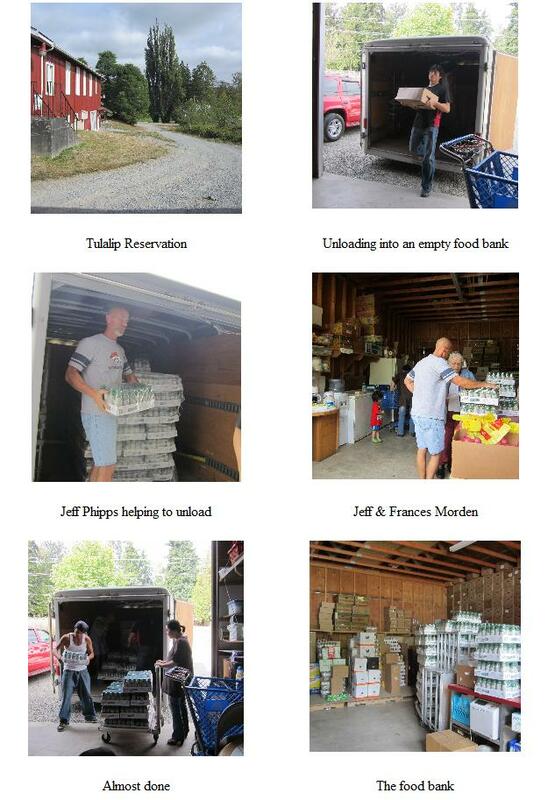 First Nation Ministries has worked with Frances Morden and the food bank for several years. How happy we were to go, once more, to this needy area. Thank you, Jeff and Sharee’ Phipps for making the trip. What a thrill to go with Leon Hansen this summer to McDermitt! McDermitt is an unincorporated township that straddles the Oregon/Nevada border and was originally called Dugout (population 513 as of 2010). Fort McDermitt was located five miles outside the current township and was established to protect the stagecoach route from Virginia City through Winnemucca to Silver City, Idaho Territory. Its elevation is 4424, 1351 feet above sea level, with a land area of 13.2 square miles. The summers are hot and dry with winters being cold with snow. 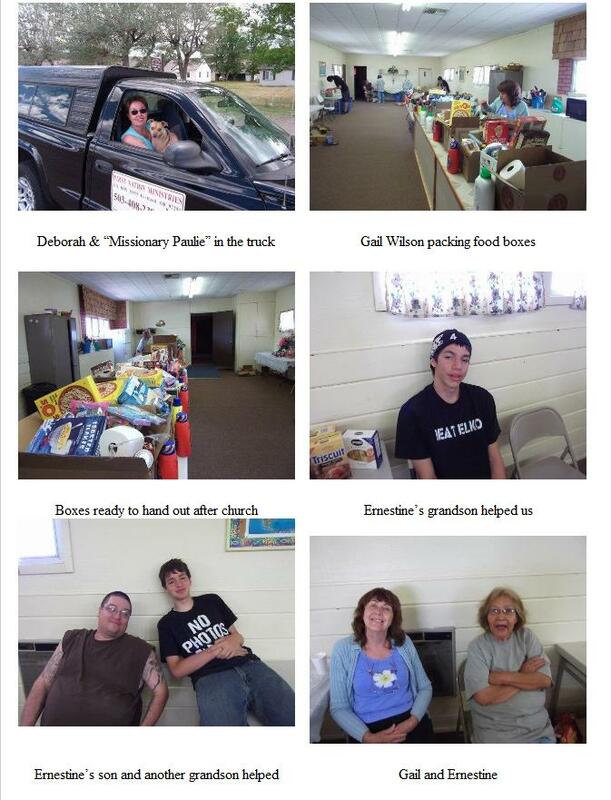 Tim and Gail Wilson are the pastors at the “Indian” church (the other church in town is known as the “White” church), but they are trying to turn it into just “Church”. What a precious couple the Lord has placed there to minister to the people. After visiting on Friday, we started packing food boxes on Saturday at the fellowship hall with the help of Ernestine Coble, her son and two grandsons. Then on Saturday evening, we were invited to a wonderful BBQ at Debbie and Randy Bryandt's home at Basque Station. When you look at the picture of the BBQ, check out the background; nothing but prairie! Beautiful, windswept country. On Sunday morning we were privileged to join in the service. Good music and a wonderful sermon; honest, heart wrenching testimonies from the people and such a time of encouragement and edification; it was hard to leave these precious people. Once you go there, you always want to go back. 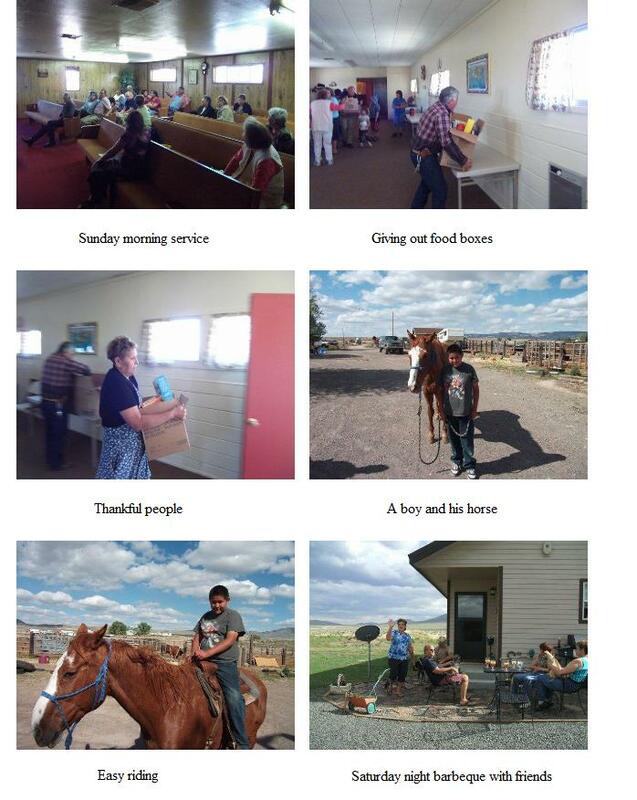 We also had the privilege of delivering a donated saddle for use in this horse country. We are the only Bible the careless world will read, we are the sinner’s Gospel; we are the sinner’s creed. We are the Lord’s last message given in deed and word, what if the type is crooked? What if the print is blurred? What if your hands are busy with other work than His? What if your feet are walking where sin’s allurement is? What if our tongues are speaking of things His lips would spurn? How can we hope to help Him and hasten His return? To hasten our Lord’s return we truly need more power. So let us all be Spirit-filled and awaiting Him each hour. In an hour that we think not, He said He should appear. Then let us walk in Holiness and meet Him with a cheer. The reason for doing the right thing today is tomorrow. We need to preach the Gospel – using words, if necessary! Amusement but not happiness, a crucifix but not a Savior, a church pew but not Heaven. WHAT MONEY CAN’T BUY, Jesus Christ can give freely without charge. The saints can shout where the hypocrites pout, if they’ll stay under the spout where the Glory comes out.